As my wife and I watched last Wednesday night's televised presidential debate, the live spectacle from Sin City, she quipped that we should've played a drinking game prompted by Donald Trump's favorite modifiers: tremendous; and disaster. There'd be no sober participants. Disaster might be a noun; but Trump uses it like an adjective. Who'd have thought Donald Trump would meet Hillary Clinton in a contest fraught with threats of imprisonment, use of nuclear weapons, and so many accusation of sexual assault and battery, not to mention endless references to obscure IRS codes? It's as though it's been a slow season for Hollywood. Perhaps the affluent minions are becoming bored with Middle East intrigues. We need a new villain. Which brings me to last year's globally popular movie, Minions; so far, box office receipts have exceeded a billion dollars...not bad for a seventy million dollar studio investment. From their voice-overs in this film, Sandra Bullock, Jon Hamm, and Steve Carrell will likely earn more from this source of lifetime royalties than from any other contract. How is this so? My theory is that, while we're in need of a villain who does not bore us, our institutional systems make poor choices of heroes. This yin-and-yang of good-and-evil produces an art of confusion; our language becomes an acceptable but confabulating word-salad with practitioners of gobbledygook like Sarah Palin and, now, The Donald. Our ears are re-wiring our brains so that we accommodate such irregular but somehow comforting verbal maladaptations...like Trump's self-minted portmanteau, bigly. 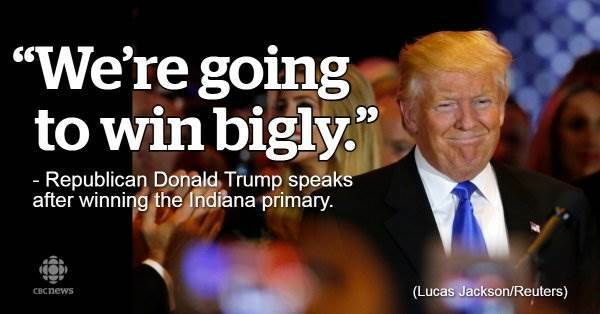 Trump's handlers have argued that he is actually saying big-league, and I understand the context (sort of.) But the candidate's overuse and slurred speech pattern makes the two expressions strangely interchangeable. And he appears to revel in its homophony. Say it again, and he'll lead us in a cheer. This particular Trump modifier reminds me of Michael Moore's frustration with the ambivalent obscurity our country's name imparts to us and others. England, an island nation, is also known as the United Kingdom and Great Britain. As the USA bled jobs to other countries while multinational companies fled, Moore lamented that this country should have a fabulous name...The Big One, perhaps? It became the title of his movie, based upon a book, Downsize This!, in which he documented the exodus of multiple thousands of good paying, benefited, full time jobs just before the turn of the century, the millennium, really. That's when the dot.com, internet technology sector bubbled up and crashed. Less than eight years later, the investment banks collapsed. The Donald would be nothing more than a distraction, an entertainment to be ignored at will; except that between thirty to forty per cent of a very dissatisfied electorate is firmly behind him. Many lost mutual funds, homes, and livelihoods. When taken completely out of context, even Trump makes sense; as does the village idiot. Social responsibility dictates we beware of such demagogues, clowns, and fascists. Trump is a modern version of this trinity; a loud-mouthed, bully-jester, ever-ready to relinquish the reins of governance to his multinational, corporatist buddies. Society is complex, and requires cooperation, not the fasciculation of locker-room jokes. Everyone has a right to exist, whether they're an immigrant, disabled, a woman, or The Other. After he loses the election, it remains to be seen whether Trump and his most alienated and marginalized followers attack our system of governance. Oh, beware, the dangers lurking in the days ahead.